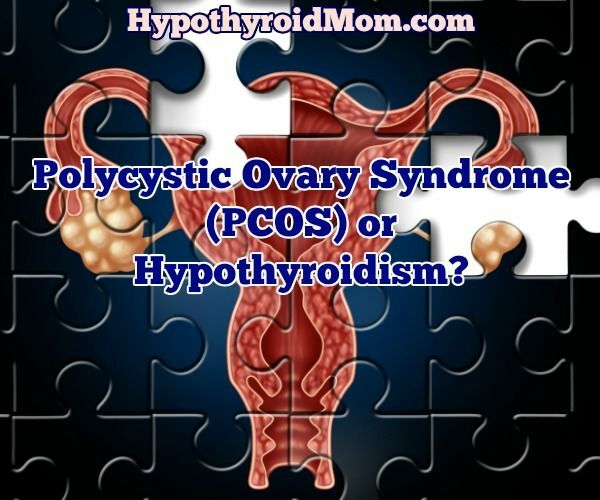 Polycystic Ovary Syndrome (PCOS) or Hypothyroidism? With a Hypothyroid Mom following of over 1.2 million people, I hear stories all the time. Common threads emerge and particular symptoms show up in story after story. One thing is absolutely clear. Every woman with PCOS should have her thyroid health fully evaluated. I haven’t forgotten all the adolescent girls that present with what look like PCOS symptoms. I created Hypothyroid Mom for adults but I know that there are many parents visiting my site with teen girls struggling with undiagnosed hypothyroidism. I know because I was one of those teens. Hypothyroid and Polycystic Ovary Syndrome (PCOS) share many symptoms. Unfortunately, this overlap is the cause of many women being misdiagnosed by a physician considering and treating symptoms and not looking for a root cause. An accurate diagnosis of one or both can mean the difference between years of struggle and the start of healing. Women with PCOS should advocate to be screened for hypothyroidism and Hashimoto’s and visa-versa. Polycystic Ovarian Syndrome (PCOS) is one of the most common endocrine disorders found in women, affecting approximately 8-20% of women worldwide, with less than 50% of them diagnosed. [i] The syndrome is present throughout a woman’s life from puberty through post-menopause and affects women of all races and ethnic groups. [ii] Women with PCOS wrestle with an array of possible symptoms including obesity, insulin resistance, irregular menstrual cycles, infertility, anxiety, depression, acne, hair loss, brain fog, fatigue, and more. 27% of women with PCOS also have hypothyroid disorders and 8% have Hashimoto’s Thyroiditis. [iii] It is unusual to exhibit every symptom of PCOS. Most women living with PCOS have some combination of symptoms. Practically speaking, PCOS has three main hallmarks: obesity, irregular menstruation/fertility issues, and hair/skin problems. Even with these criteria in place, diagnosis can be tricky. Symptoms can vary widely based on life stage, genotype, ethnicity, and environmental and lifestyle factors such as body weight and eating habits. Birth control pills may also interfere with test results because they lower androgens. With this in mind, physicians must eliminate other possible causes of a woman’s symptoms such as hypothyroidism. Second, if a doctor is looking simply at symptoms, the thyroid induced increase in the number of androgens in a woman’s body looks like PCOS associated hormone imbalance. Third, thyroid testing may be incomplete or the reference ranges inaccurate. How can a woman be certain of their diagnosis? I encourage all women with a PCOS diagnosis to have their thyroid checked to be sure it is not the root cause. Do not settle for the simple Thyroid Stimulating Hormone (TSH) test. It is not necessarily accurate, in part because inflammatory conditions (such as PCOS) reduce the action of your body’s TSH, which means that even if your levels are in the “normal” range, you may not be producing enough to be effective. Request a full thyroid panel including TSH, FT4, FT3, RT3, TPOAb, and TgAb. Once your diagnosis is certain and your labs are complete, it is time to begin healing. In fact, you can begin even before diagnosis since many of the diet and lifestyle changes that benefit hypothyroidism also benefit PCOS. I suggest beginning in three broad areas. 1) Mindset – Being diagnosed with PCOS can be an overwhelming experience. With the disorder affecting so many aspects of our lives, it can feel isolating and scary. It’s very easy to slip into a negative head space. Stay in a confident and productive mindset by seeking out support, being patient but persistent, caring for your emotional and mental health, practicing self-forgiveness, and practicing self-love. Decide that it is time to heal and that you must take charge of your health. The moment you decide that you are worth the time and effort it takes to heal, you have taken the most important step. 2) Diet – Both hypothyroidism and PCOS involve a high level of systemic inflammation. This study demonstrated that an anti-inflammatory dietary combo achieved weight loss and signifiant improvements in body composition, menstrual cyclicity and spontaneous pregnancy rate in overweight and obese women with PCOS. [v] Upgrading to an anti-inflammatory diet can bring relief from many symptoms. Eliminating common inflammatory staples such as processed foods, gluten, and dairy takes work, but the positive results can manifest in as little as a few days. Supplements can help fill in dietary gaps and also relieve inflammation, regulate menstruation, and manage blood sugar. I suggest that almost all women take a high-quality multivitamin, vitamin D, and DHA (fish oil). Ovasitol Inositol Powder is also very popular due to its positive effect on blood sugar and menstrual regularity. I often hear from women with PCOS who are frustrated and have lost all hope because the only advice their doctors offer is to lose weight, take a pill, and live with their symptoms. For much of my life, I was one of these women. As early as age 14, I wrestled with a lot of the common PCOS symptoms. It seemed this was my fate. My mom dealt with this. My grandmother dealt with this. It was the genetic fate of women in my family. One day in college, I found myself sitting in a cold exam room scared and confused, feeling lousy, not having had a period in months and months, and not understanding why. The doctor looked me in the eye and told me they would have to “jump through hoops” to get me pregnant one day. She renewed my prescription for the pill and sent me on my way. I felt helpless and hopeless. It was a dark moment. Many years later, with the help of fertility drugs, I did have two sons. After the birth of my second son, I felt worse than ever. I had 2 beautiful children and a wonderful husband, but I was exhausted all the time, and my PCOS symptoms were at their worst. I wasn’t the wife or mother I wanted to be. After years of following mainstream advice from countless doctors, I realized that nothing was helping. The drugs they offered made me sicker and more miserable. I was way too young to feel so old and couldn’t go on living this way. It was then I realized that I had to empower myself and take control of my health. No one else could do it for me. My husband noticed the shift and declared me a “Diva.” At first, I was offended, until I realized that in order to be my best and give my best to my family, I DID have to be a Diva. Amy Medling, author of Healing PCOS: A 21-Day Plan for Reclaiming Your Health and Life with Polycystic Ovary Syndrome and certified health coach, specializes in working with women with Polycystic Ovary Syndrome (PCOS), who are frustrated and have lost all hope when the only solution their doctors offer is to lose weight, take a pill, and live with their symptoms. In response, Amy founded PCOS Diva and developed a proven protocol of supplements, diet, and lifestyle programs that offer women tools to help gain control of their PCOS and regain their fertility, femininity, health, and happiness. [i] Sirmans, S. M., & Pate, K. A. (2014). Epidemiology, diagnosis, and management of polycystic ovary syndrome. Clinical Epidemiology, 6, 1–13. [ii] Thatcher, Samuel, PCOS: The Hidden Epidemic, Indianapolis, Perspectives Press, 2000, 320. [iii] Kowalczyk, K, et al. “Thyroid Disorders in Polycystic Ovary Syndrome.” European Review, Eur Rev Med Pharmacol Sci, Jan. 2017, www.europeanreview.org/article/12104. [iv] Rotterdam ESHRE/ASRM- Sponsored PCOS Consensus Workshop Group. Revised 2003 Consensus on diagnostic Criteria and Lon-Term Health Risks Related to Polycystic Ovarian Syndrome. Fertility and Sterility, 2004; 81, 19. [v] Salama, A.A., et al. Anti-Inflammatory Dietary Como in Overweight and Obese Women with Polycystic Ovary Syndrome. [vi] Allmenning, I., et al. Effects of High Intensity Interval Training and Strength Training on Metabolic, Cardiovascular and Hormonal Outcomes in Women with Polycystic Ovary Syndrome: A Pilot Study. PLoS One. 2015;10(9):e0138793. Thank you! I found a great NP who specializes in hormone therapy and I’m pinning my hopes on her. That’s wonderful to hear Julie. I hope this NP helps you get back to thyroid healthy. Good to have you at Hypothyroid Mom. The reliance on lab values alone is noting short of malpractice by the medical community. I am losing my hair, my memory has evaporated, my bladder is damaged beyond repair, I have IBS, my iron is so low I can’t breathe properly. My TSH has gone from 1.4 to 2.3 in 2 years. I often project my options onto the doctors I’ve relied on and I ask, would they accept these symptoms and not look for the underlying cause? would they accept those TSH scores as normal and get on with their lives, esp if they physically and mentally could barely make it through the workday? Hello I am really looking for all donations and prayers, I’m getting ready to have my thyroids removed and I’m very scared due to I am going threw this by myself with no friends or family. Just wanted to reach out to the thyroid community to release what I’m about to face and go threw. Thank you for your time. Lakisha, I am so sorry to hear all you are going through. Please email me [email protected] I would like to hear your story and find a way to help.